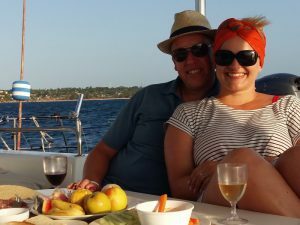 Zanzibar Sunset Cruise | Dinner Cruise Option on our Luxury Catamaran. ENJOY OUR ZANZIBAR SUNSET CRUISE WITH A DELICIOUS SEAFOOD DINNER! The Best Zanzibar Sunset Cruise Dinner setting by far! Enjoy a Romantic Sunset Dinner Cruise for two! Join us onboard for our Zanzibar Sunset Cruise out into the bay of Nungwi. 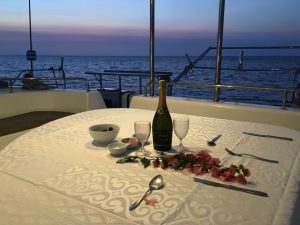 Bring your loved one or friends and family and enjoy the tranquility of gliding through the warm Indian Ocean waters aboard our beautiful yacht with an ice cold tropical cocktail or a glass of bubbly in your hand. As the sun sets we will moor the yacht and prepare a splendid, freshly prepared Seafood Dinner Buffet for you and your loved ones, friends and family. Indoor and outdoor seating available onboard. Escape from your hotel dining room! There is no better way to end your day in the tropics whilst enjoying a stunning Sunset Dinner Cruise on the Indian Ocean! We have tailored this intimate Sunset Experience for couples…or bring your family & friends of up to 6 guests. Of course should your group be bigger, contact us and we will make arrangements to accommodate you and all your family and friends onboard. Max out on absolute enjoyment! Escape from your hotel for a few hours of bliss! Our Sunset Dinner Cruise departs from the beach here in Ras Nungwi on the northern tip of Zanzibar Island. Cruise departs from Nungwi Beach at 4:30pm and we return to the beach at 8:30pm. Contact us and we will book your Hotel Transfers to Nungwi for you with our Service Provider. This transfer service will pick you up from your hotel reception and return you to your hotel after your cruise.